This year Lisa Allen of Northcote starred again in BBC2’s Great British Menu. The concept this year was to create ‘sharing dishes’ with an emphasis on creating diner participation and interaction. For the second year Lisa was announced the North West regional winner enabling her to cook through to the finals. Unfortunately, despite Lisa’s high scores her dishes were not chosen for the banquet. However the banquets’ loss was our gain as Northcote hosted a number of GBM evenings where the whole of Lisa’s menu was served. Upon arrival we were served a very nice British ‘Champagne’ and a selection of Canapés which included a homemade fish finger & ketchup! We were then taken through to The Louis Roederer Room – a private dining room – where the tables had been arranged together to form one long banquet table in the spirit of the Great British Menu. It was the first time i’d eaten in a top restaurant sat next to and facing strangers and it felt slightly uncomfortable at first. The Louis Roederer Room features a large plasma screen TV, on which were highlights of Lisa on The Great British Menu. They were timed so that we could watch her preparing and serving the dish just before the same dish arrived for us to eat. After we finished the TV would continue with the judges responses before moving onto the next course. 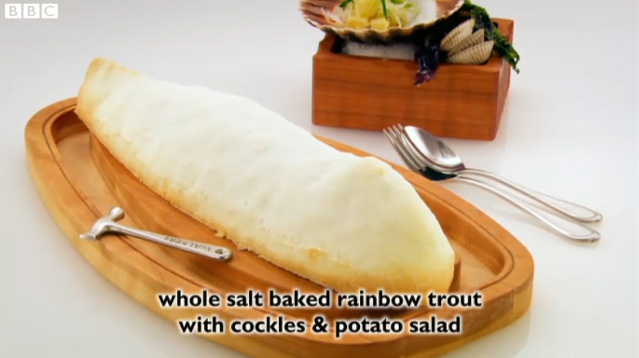 After watching Lisa preparing her starter on the show, the TV was paused and finally the first course arrived. Crispy Shoulder Of Suckling Pig, Pancakes, Dip. This clever twist on the classic Chinese crispy duck and pancakes looked impressive as it was brought to the table on a large serving platter. There were several suckling pigs placed along the table, one each for approximately 5 or 6 people. We were then informed that we were required to carve and serve the dish ourselves, or rather each other, again in the spirit of the GBM. Being quite fond of carving meat I volunteered to carve and serve the pig nearest to me, an offer which was unanimously accepted as most people appeared reluctant. After serving my new friends I finally got to taste the dish, and wow, it had been worth the wait. I’m a huge fan of crispy duck and pancakes but this was so much better. It worked perfectly, the suckling pig itself was stunning, cooked to perfection and literally fell off the bone (‘carving’ was as simple as pulling apart with 2 forks). It was served with juliennes of apple and onion which complimented the meat perfectly and a sauce of roasting juices and lemon juice. The flavour combination was absolutely fantastic. My only complaint was that the pancakes were rather small but it’s only a minor point as there were plenty of them so making multiple was not a problem. In fact the portions were incredibly generous and we probably could have managed with 2 or 3 less pigs at the table. Salt Baked Sea Trout, Cockles, Shrimp, Potato Salad, Fennel. The second course arrived much like the first, with several fantastic looking platters carried out and placed on the table. This time I was recommended to serve again. This involved taking the hammer and breaking the salt crust to reveal the whole baked trout inside. The fish was cooked perfectly, not an easy task when there is no way of checking once the fish is encased in the salt crust. It was stuffed with cockles and shrimps which were beautiful and the juices tasted amazing. This was served with a potato salad and fennel which was very light and a great accompaniment. A delicious, stunning and totally flawless dish. Again the portions were incredibly generous due to the size of the trout and the number brought to the table, a whole trout of this size feeds 5 people very comfortably. 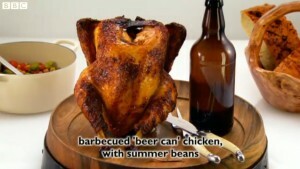 Barbeque ‘Beer Can” Cornfed Chicken, Sumer Beans, Potato Skins, Tear and Share Bread. When the main course arrived it seemed to be accepted that I would again carve and serve so I reached for the knife without a second thought. The chicken was cooked perfectly and the flavour glaze on the outside was fantastic. A few of the servers (myself included) were a little unsure whether the contents of the beer bottle should be poured over the chicken or into a glass. I guessed the chicken and thankfully it turned out to be a gorgeous rich gravy. Of the accompaniments, the tear and share bread was nice if a little unspectacular, the potato skins where incredibly crunchy and added a great texture contrast. My only complaint was the haricot beans from the ‘summer beans’ which were a little too al dente for my liking although I have no doubt that it was the way Lisa intended them rather than them simply being undercooked. Otherwise it was another highly successful dish. 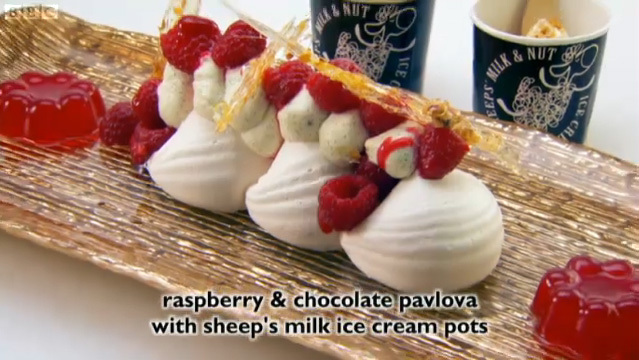 Raspberry and Chocolate Pavlova, Sheep’s Milk & Nut Ice Cream Pots. The Pavlova we were served on the night looked even more stunning than the picture above as it was double the size. Again I took control of serving duties, thankfully it was the easiest dish of the night and the pavlova sections came away easily. I was worried about being able to eat a dessert after over indulging on the previous 3 courses, thankfully this dessert was incredibly light. The meringue was by far the best i’d ever tasted, so light and crunchy on the outside with a slightly gooey almost marshmallow centre. The cream added richness and the raspberries added sharpness, the stunning shards of spun sugar added texture and looked amazing. The sharp, fresh raspberry jelly complimented it perfectly. We were also served with sheep’s milk ice cream in small cardboard pots with wooden spoons which brought back memories of my childhood from fair grounds or pantomimes. The ice cream tasted good but was very melted which was disappointing. Finally we were brought coffee and petit fours, for the first time ever in my dining experience I was unable to try even one of them. They looked great but I could not eat another thing after one of the biggest feasts i’ve ever consumed. I was reluctant to sit next to strangers, I was reluctant to serve myself and others but by the second course I was actually enjoying it and making conversation with the people around me. So in that respect Lisa’s menu totally fit the brief, as it did on a purely gastronomic basis too, every dish was fantastic. To end the night Lisa joined us and answered many questions about the dishes and the process of making the TV show. She was very friendly insightful and it was a loverly end to a fantastic evening. Thanks Lisa!